Claire Donovan always dreamed of visiting Venice, though not as a chaperone for a surly teenager. 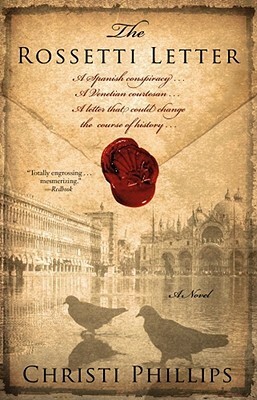 But she can't pass up this chance to complete her Ph.D. thesis on Alessandra Rossetti, a mysterious courtesan who wrote a secret letter to the Venetian Council warning of a Spanish plot to overthrow the Venetian Republic in 1618. Claire views Alessandra as a heroine and harbors a secret hope that her findings will elevate Alessandra to a more prominent place in history. But an arrogant Cambridge professor is set to present a paper at a prestigious Venetian university denouncing Alessandra as a co-conspirator -- a move that could destroy Claire's paper and career. The Rossetti Letter is the kind of book you take with you to read in the sun, whether in the garden or on the beach. It is easy and quick and gives you all you would expect from a summer read, with some history thrown in for good measure. I enjoyed the book; however, where it fell down in my eyes was the portrayal of Alessandra. I simply didn't care about her. Claire's story arc held my attention, but Alessandra's life and loves didn't captivate me so much, so I felt no emotional attachment to her during her troubles. Nor did Phillips give us enough time/detail with the other 17th century characters for us to engage with them either. Though based on history to an extent, most of the characters are fictional, so it's not a story that inspires you to dash off and read more about the time and people. All up, a pleasant read, but not a book you would return to again and again.